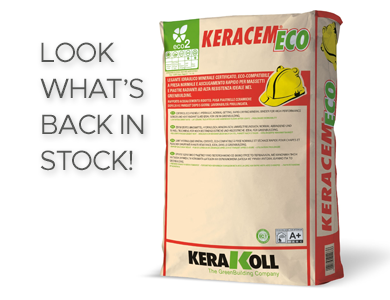 Keracem ECO – Back In Stock! Keracem Eco is an ecologically-friendly, hydraulic mineral binder with normal-setting and rapid-drying properties. Ideal for high-performance screeds and heat-radiant slabs. When mixed with inert materials of assorted grain size from 0 to 8mm, Keracem Eco creates screeds of high dimensional and constant moisture stability. The rapid set allows the safe laying of ceramic tiles after 24 hours and hardwood floors after just 5 days. The perfect product to use in GreenBuilding, can be recycled as an inert material at the end of its life. IN STOCK NOW!!! Call us on 01709 261 007 for more details.